Mma Ramotswe and her friends are back in the 15th installment of the adventures of the No. 1 Ladies' Detective Agency. This time, people are branching out into new careers in The Handsome Man's De Luxe Cafe. The detective agency is still attracting new clients. 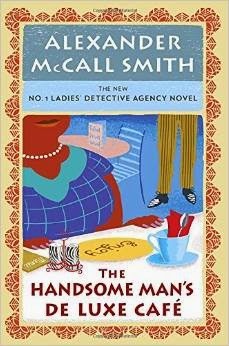 In this book, Mma Ramotswe and her co-director, Mma Makutsi are approached by a man and his sister to help them get to the bottom of a mystery. They are part of the Indian community in Gaborone, and an Indian lady they do not know has come to their house and claims to have amnesia. They want to help her, but have no idea where to begin. The immigration authorities are becoming impatient with this person who has no papers, and therefore, a somewhat dubious claim to be allowed to remain in the country. How will they get to the bottom of this mystery? Luckily, they have a new employee who can help them with surveillance. Charlie, the apprentice mechanic who can never pass the exams to finish his apprenticeship, has been let go by Mr. JLB Matekone. The garage isn't doing as much business as in the past, and so someone had to go. Since the garage and the detective agency share a premises, Mma Ramotswe hears the commotion that occurs when Charlie is informed that he no longer has a job. Feeling sorry for him, she offers him a position at the detective agency. After all, Mma Makutsi is now a partner in the business, so perhaps she won't have time for all the mundane, day-to-day tasks that need to be done in the office. Also, Charlie's position is so new that people won't recognize him if he needs to follow someone. This is just what happens when he's given the assignment to follow the amnesiac lady. Unfortunately, while waiting for her to emerge from the house and actually go somewhere, he gets a bit distracted when a pretty girl walks by . . .
At the same time, Mma Makutsi, fresh off her promotion at the detective agency, decides to branch out into the restaurant business. She plans to leave the day-to-day running of the restaurant in the hands of others, but she will be the boss, make no mistake. She feels that there needs to be a place for the "fashionable" people to gather, and her restaurant will be just that place. There are plenty of people who need to be hired, though, and in her haste to get everything up and running, she takes some bad advice. This wouldn't necessarily be a fatal mistake, but guess who is the new restaurant critic for the local newspaper? None other than her mortal enemy, the evil 50% Violet Semphotho. Apparently there weren't enough Handsome Men in the cafe at the time of her visit, because she was especially mean in her review. Will the fashionable set be put off by her catty remarks? And when will Mma Makutsi ever learn to listen when her shoes are speaking to her? Not everyone has talking shoes, so you would think this alone would cause her to take note of their comments. Once again, we have a very pleasant visit with our friends at the No. 1 Ladies' Detective Agency. The only small quibble I have is that Mma Makutsi is starting to be a bit annoying with her ill-advised remarks and her judgemental ways. Everyone has to tip-toe around her, and it's all starting to be a bit uncomfortable. She was always my favorite character, and I hope she won't become more unlikeable in future books.